Got paint stains in your carpet in Birmingham AL! Here’s how to get rid of them. 1. Blot up the excess paint spill with paper towels or a towel. 2. Apply Heaven’s Best Spot Remover with a damp towel. 3. Blot the stain. Don’t rub. Continue to blot. 4. Soak a towel with clean water and rinse the spot. Continue blotting until the stain is gone. 5. If the first treatment does not work, reapply Heaven’s Best Spot Remover again on a damp towel. Blot again until the spot dissolves. 6. Use a towel soaked with clean water to rinse the spot. 7. Let the spot dry. If you don’t have Heaven’s Best Spot Remover, call Heaven’s Best of Birmingham to purchase a Lifetime Bottle of Spotter for $12. Once you buy the bottle, we will refill it free. Just call us at (205) 618-9150 for delivery options. Or, if you don’t have time to clean the stain yourself, call the Professionals at Heaven’s Best to schedule a Carpet Cleaning. We have professional spot removers for almost any type of stain you have. Heaven's Best Carpet & Upholstery Cleaning is a Veteran-owned, Professional, Full-service Carpet, Upholstery & Floor Cleaning Company specializing in Low-Moisture Carpet Cleaning, serving Jefferson & Shelby Counties. Our unique low-moisture cleaning process is in high demand because it doesn't soak your carpet or damage the fibers. As a result, your carpet will last longer and will dry faster, usually in one hour, so you can get back to your daily routine in no time. 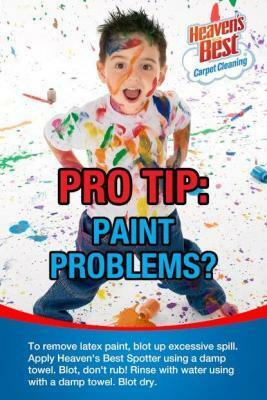 Don’t let a paint stain in your carpet in Birmingham AL spoil your entire rug, call us today at (205) 618-9150.